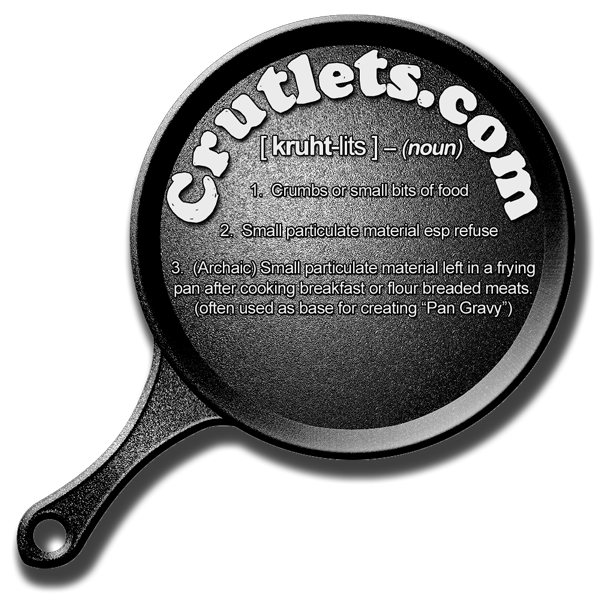 My great grandmother used the term crutlet to describe the bits of food left in the pan after frying bacon, sausage or breaded meat. Of course when one person uses a word around their kids, the kids are likely to use the word as well. This is how crutlets came to be a word in my family's daily lexicon. Crutlet has evolved over time and is now used by my family to describe any and all small bits, particles, crumbs or pieces of anything whatsoever with the sole criteria for qualification as a crutlet being small-ish in size. In short, it describes any particulate material. The reason I'm so fixated on this word is that it's in fact not a word--yet! Like most of my family, I grew up using the word as I've described. Unbeknownst to me, crutlet is a made up word coined by my great grandmother as best we can tell. Honesty, most people wouldn't care, but to an English major, it amounts to a grievous sin to not use a word properly, or to unknowingly use a word that isn't a word at all. I feel it is therefore my duty to ensure that this coined word someday makes its way into Webster's great tome. This website is the beginning. It's also a joke, if you are unsure, and a launching point for the blogs of both my wife and I. Thanks for checking it out.